Then there is the potential for deep water soloing Already there are some established routes for this. In many ways this is the next great frontier. All you need is a pair of shoes and an absence of fear and you can go put up 10 new "routes" a day. I reckon that as word spreads, Railey will become the center of a deep water soloing meca... Information on deep water soloeing is here. The traditional spot is on the obvious wall as you come onto Phra Nang Beach. This is a fantastic spot. Deep sand, fingery and technical low down, and fingery technical overhanging and ultra hard higher up. There are an almost inifinite number of problems and variations on this piece of rock. I love bouldering here and over the years have left gallons of sweat skin and fingernails on it. Whenever I come back it is always the first spot I come to test my strength against the days when I thougt I was strong. It never rains here as the towering rock above provides a permanent roof. It is the favorite spot of the Thai's who have got the thing so wired that they can now just flow accross it. The basic right to left traverse is about a 6b+ with a 7a crux (I can't talk boulder so you'll have to put up with my approximation). If you go from right to left I reckon it's about a 6c+ with a 7b crux, but then that may be because you are already pumped from going the first way. I like to continue this one as far as you can go, right around the big bulge of choss, towards the little caves, finishing on along a sort of upward sloping crack/ break which ends in a little knob of a stalactite. (admire the chalk marks beyond). There is a high traverse of about 7a+ easier if you are shorter.... There is also a classic stalactite boulder problem, off the deck, onto the stalactite, up over to the wall and down- around 7a+ but a little more scary. Then there are lots of little problems to tweak yourself on from 6a to 9a. Some I've tried for years and given up as impossible, only to watch some unfeasibly strong kid style up it. Some I've thought beyond impossible and watched some of the worlds strongest making heroic attempts at. As you come onto Tonsai beach, walking the jungle path from Railey, there is a great little wall for traversing, with a few interesting problems on it. (6c traverse?). Next to it there is a tasty little boulder, with some really quite tricky and quality problems to the top. 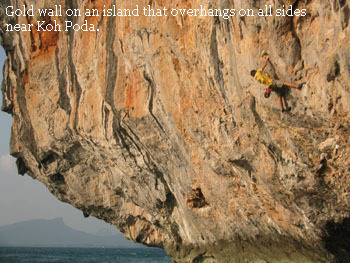 If you want to boulder boulders, then Koh Tao is a good place to go. There is a great site on it here..